Authors: Skryabina E.N., Safonova V.N., Agareva Т.А. Eosinophilic granulomatosis with polyangiitis (EGPA) is a rare disease that affects small and medium-sized blood vessels of different organs, characterized by asthma, prominent peripheral blood eosinophilia. Cardiac involvement was reported in 20-50% and it is the major cause of mortality. A case of EGPA in a 43-year-old female, who had endocarditis, associated with thrombus formation in left ventricle, thromboembolic syndrome and recurrent stroke has been reported. The described case has showed that it is of crucial importance to perform the full cardiac imaging even in asymptomatic patients with suspected EGPA. The early identification of cardiac involvement may lead to better prognosis. 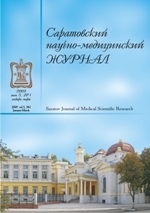 All articles of the authors: Skryabina E.N., Safonova V.N. , Agareva T.A. Authors: Romanova I.A., Magdeeva N.A., Nikitina N.M. The article presents clinical case of unfavorable outcome of amyloidosis of kidneys in a patient with rheumatoid arthritis. The absence of basic treatment and persistent activity of disease leads to fast progression of nephrotic stage of secondary amyloidosis in a young woman. All articles of the authors: Magdeeva N.A. , Nikitina N.M. , Romanova I.A. Authors: Malinova L.I., Furman N.V., Dolotovskaya P.V., Puchinyan N.F., Kiselev A.R. The purpose of the review is to characterize existing in open access bibliographical databases such as eLibrary and PubMed evidence on clinical impact of morphometric platelet indices as markers of platelet aggregation ability and turnover as a methodology and theoretical framework of further investigation. Studies results were pooled from open access bibliographic databases (eLibrary, and PubMed) according to modified PRISMA algorithm. Relevant studies were identified by systematic searches of the original studies published during the last 10 years in the Russian and English languages. Results of 96 original studies in accordance with inclusion criteria were published during the last 10 years in scientific journals indexed in eLibrary, and PubMed. The majority of publications (64.58%) consist of evidence pro diagnostic and prognostic significance of platelet indices. Studies demonstrating the significance of platelet indices as possible risk markers of thrombotic events in cardiovascular patients were predominating among "pro" publications. In 15.63% published results contradict concept of platelet indices usefulness as diagnostic and prognostic markers in clinical practice. Morphometric platelet indices can be considered as useful diagnostic and prognostic markers of thrombotic events in cardiovascular patients. Existing gaps in evidence suggest the need of further investigations. Aim: to assess the importance of the Centers of Health in the organization and provision of preventive care to the population, in the early detection of risk factors for the development of chronic non-communicable diseases and the development of a healthy lifestyle. Material and Methods. On the basis of the Health Center of Engels Center for Medical Prevention in the Saratov Region, the detection of risk factors for 2011-2015 was analyzed according to statistical reporting (form No. 68) and health cards (form025-CZ/y) of 207 patients. To assess the satisfaction of visitors with the work of the Center, a specially developed questionnaire was conducted, which included 22 questions that characterize the patient profile, his attitude to the organization and the results of the survey, and the motivation to modify the way of life. Results. The study confirmed the important role of the Centers of Health in the organization and provision of preventive care to the population, the formation of a healthy lifestyle and the early detection of diseases and risk factors for their development. Conclusion. Only joint efforts of medical institutions, authorities, educational organizations, mass media can lead to the formation of the population's responsibility for their health and readiness to modify the way of life. All articles of the authors: Sidorova N.V. , Shemetova G.N., Gubanova G.V. Authors: Fomina A.V., Grigorieva N.A., Shovkun N.V. Objective: study of the current state of medical support for children in educational organizations and an assessment of the needs of children with disabilities in medical care. Material and Methods. According to the results of the sociological survey (1796 profile views), the analysis of the health workers' activities in educational organizations implementing the adapted basic general education programs was carried out. According to the preventive examination of children with disabilities (124 people) and of the survey of parents (124 profile views), the article assesses the effectiveness of preventive work with children and parents to strengthen the dental health of schoolchildren in Moscow. Results. The majority of medical workers in educational institutions implementing adapted basic general education programs are represented by specialists with secondary medical education (77.2%). Among specialists needed in educational organizations, dentist is often called. The need for children with disabilities in dental care is confirmed by data obtained during the study of dental health of children with hearing impairment and children with visual impairments. Conclusion. One of the areas of medical care for children with disabilities in educational organizations is active monitoring of the health of children and the implementation of comprehensive preventive measures, which requires the involvement of more health workers. All articles of the authors: Grigorieva N.A. , Shovkun N.V.